Stanislav Benderschi — half-Russian, half-Portuguese — opened this coffee destination in June 2015. While far from the first local roaster/café combination within Lisbon’s city limits, it is certainly one of the most modern at doing it. In front there are several streetside tables under awnings, advertising their “Best beans. Great coffee.” slogan in unabashed English. There’s a lot of English language suffused about here — such as the sign that instructs its patrons with, “No WiFi. Drink coffee.” And yet despite the International nod that this brings, Fábrica does not completely betray its Lisbon roots; it manages to successfully straddle both the local and the global. Inside is a bit more of the typical, aging coffeehouse you might find in San Francisco in the 1990s: a mix of rough wooden furniture and chairs, brick walls, scuffed wooden floors, and a chalkboard coffee menu. In back is their Probat roaster, purchased in Germany, where they roast about weekly and accumulate a bit of their roasted coffee and merchandising for sale (T-shirts, coffee accessories, etc.). The baristas are a friendly, international bunch — from the service-oriented Lisboeta, Claudio, to Alexander from Kiev who speaks absolutely no Portuguese. This local/global mix is also reflected in their clientele, which seems equal parts Portuguese locals and foreign expats or tourists. Mr. Benderschi has decidedly tried to establish a comfortable, albeit international, environment for Lisboetas — raising their coffee standards while banking that more will additionally seek out their roasts for home use. There’s little to the menu here besides coffee, but who’s complaining? Using a three-group La Marzocco GB5, they pull single (€1,20) or café duplo (€1,70) shots with a thicker, medium-and-lighter-brown striped crema. The duplo is three sips short in a larger logo IPA ceramic cup. It has a full body with a solid mouthfeel and a dynamic flavor range of apple brightness, molasses, and some cloves. It’s truly gorgeous and rather exemplary. Whereas Copenhagen Coffee Lab feels like an interloper, Fábrica manages to feel steeped enough in the local coffee culture while advancing quality standards and looking outward. Read the review of Fábrica Coffee Roasters in Lisbon, Portugal. Danish owners, Ida de Matos and twins Helle and Susan Jacobsen, created an outpost of their Copenhagen coffee laboratory mothership here in the Príncipe Real district of Lisbon. It’s a Scandinavian curiosity dropped in the middle of Portuguese coffee culture, creating something of an alternate of good quality for exploratory locals. It’s a quiet space despite the soundtrack. Everything inside here is white: service counter, tile floors, metal stools, café tables, employees, and most patrons. The expat factor is unavoidable, with English-speaking foreign students and — sadly yes on my visit — the obligatory man bun. Inside it’s a youthful vibe, heavy on laptop zombies. There are a few indoor tables and odd seating options, including an isolated room in back. Shelves of coffee merchandising sit at the front and rear of the shop. They offer pastries and salads, a breakfast menu, light lunches, and even Knækbrød (Scandinavian crispbreads). They have a particularly lengthy coffee and espresso menu, leveraging the coffee they roast at their Copenhagen headquarters and offering it also as V60, Aeropress, or Chemex. The options of the day were primarily Brazil or Kenya single origins. The barista, who will step out for a smoke given even Portugal’s non-smoking laws of the past decade, uses scales for precision weighting. Espresso can come as a single shot (€1,30) or a café duplo (doppio, at €2). Using a two-group Astoria machine, their default Brazil double espresso came with a medium brown, even crema. The shot was medium-to-thin-bodied with some acidic brightness on the finish: less cherry and more raspberry. It’s a rather classic light roast, with the dynamic range of the flavor profile cut short and weighted more towards brightness with some limited mid-palate. Served in Acme & Co ceramic gray cups. A good, alternative espresso in the thick of Lisbon, However, as a visiting tourist, the experience might be a little too familiar. But then when I travel, I generally prefer things that express more of the local coffee culture — and less of what seem like cultural imports that you can practically find carbon copies of in various other cities around the world. Read the review of Copenhagen Coffee Lab in Lisbon, Portugal. This coffee shop opened in early 2009 in San Diego’s transitional Barrio Logan. This neglected industrial and shipbuilding neighborhood, located in the shadow of the San Diego-Coronado Bridge, is home to a few thousand mostly Latino residents. But that mix, and the mix of local businesses, is gradually changing with the winds of gentrification: alongside Latino murals, welding and machine shops, recycling centers, car repair joints, and grittier homes now stand microbreweries, cross-fit gyms, and hipster coffee shops. Unlike San Francisco, where many see the arrival of an upscale coffee shop as the death of culture as we know it, in Barrio Logan most of the neighborhood friction concerns its mixed-use zoning where toxic chemicals, residents, and art studios struggle to co-exist side-by-side. A coffee shop/roaster such as Cafe Virtuoso is still industrial enough to blend in with its neighbors. Over the years, as San Diego laggardly opted to get serious about coffee, Cafe Virtuoso has slowly earned something of a loyal following among locals in-the-know. There’s outdoor sidewalk seating in front with three metal tables and a parasol. Just inside the front door there’s a small room with three tables and artwork made of burlap coffee sacks on the walls. Past that is the main bay: a large industrial space with slab concrete floors that hosts coffee serving, roasting, and retail space. In the main bay there are three additional metal tables with steel stools for seating. A baker’s rack of roasted coffee, brewing equipment, and tea dominates a section parallel to the service counter. A yellow Diedrich roaster draws attention at the center of the space (they’re San Diego’s only 100% certified organic roaster). Parked in back, when not out on the road at events, is a UNIC mobile cart. The comparatively small service area features a menu split between regular and premium espresso shot options, served from a two-group La Marzocco Strada, in addition to pour-over coffee and (nitro) cold brew. Using their House Espresso, they pulled a shot with an event medium brown crema that ran slightly thin on thickness. It was light-bodied, fruity, and expressed some mild spice in addition to some roasted almond bitterness — a touch of which might be due to slight overextraction. It’s a solid shot, even though it shows some technical softness around the edges that could be tightened up with stricter standards and attention to detail. Served in a white notNeutral demitasse with sparkling water on the side. Read the review of Cafe Virtuoso in San Diego, CA. Even the food here is its own thing. Between sopapillas, calabacitas, carne adovada, and Hatch Valley chiles (and ordering things “red”, “green”, or “Christmas”): it’s not Mexican, and it’s not Tex-Mex either. New Mexico can probably even lay claim to its own state of mind, defining the term high desert. Anywhere you turn starts from at least 6,000 feet of altitude. The combination of the altitude and arid climate can leave you with mild headaches and nosebleeds for days after arriving. Any notable breeze will result in red dust and grit in your teeth. I last visited this region one winter in the 1990s, passing through one bleary-eyed day in the high-desert driving across I-40 from Flagstaff, AZ to Oklahoma City as part of a marathon trek across the country. Even back then I found Albuquerque more than a little odd, with the entire stretch of the town littered with “experimental speed limit” caution road signs. Experiencing it close up two decades later, it’s far stranger than I could have imagined. The residential areas are typically a criss-cross of wide East-West-bound boulevards littered with strip malls, with North-South streets (like Washington St. NE) jaggedly intersecting like misfit puzzle pieces so there’s never a continuous line through the many lots of ranch homes, covered car ports, and gravel landscaping. On the subject of food, simply eating here reminds you that Albuquerque is not your typical American city. The most exclusive restaurant in town — universally voted the biggest “splurge” restaurant in ABQ — is run by a three-time James Beard nominee. In true ABQ style, it resides in a local strip mall, next door to a hydroponics shop and across the street from a drive-thru emergency loan shark/cash station called Fastbucks. That’s how ABQ rolls. Among friends I’m known for identifying the TV trope of the generic “fancy restaurant”: high-end dining establishments that have zero distinguishable interior design. Meanwhile, real-life restauranteurs often bleed ridiculous amounts of money to heavily brand their high-end dining room experiences so you always know exactly where you’re eating. For all that Better Call Saul gets right about the town, there was a scene in an episode last month where they dine at one such generic “fancy restaurant” in Albuquerque. If you spend any time in ABQ, you’d immediately recognize that no such place could exist in town. Better Call Saul does, however, nail the region on lawyers. Albuquerque is overflowing with courthouses and law offices, with the billboards of personal injury attorneys lining Interstates 25 & 40 with come-ons such as, “Hurt? Call Bert”. Is it any wonder why Bugs Bunny should have turned left? Downtown ABQ gets even stranger. There’s a vast sea of multi-story parking garages, largely filled with cars, scattered among the remains of aging U.S. Route 66 kitsch and the tinted glass monoliths of more modern-yet-nondescript bank and energy company towers. And yet walk the downtown streets on a weekday afternoon a couple hours before rush hour and it is eerily devoid of pedestrians or even traffic. Which gives downtown ABQ the feel of a giant long-term airport parking lot for alien abductions: nobody is here, and yet everyone has left their cars behind. We’ve written before about Austin, TX and their “Keep Austin Weird” motto. But the people here, although very friendly, are simply just too weird for Austin. More to the point: they’re blissfully unaware of their weirdness, thriving as an amalgamation of teen and adult runaways, Native Americans, silver-toothed street urchins, and the progeny of prior vehicle breakdowns along U.S. Route 66 to California. All of this makes Albuquerque a more than unusual base for developing a quality coffee culture, which most cities typically identify with urban hipsters. The bizarro culture of ABQ essentially renders a hipster’s raison d’être as pointless and irrelevant. If anybody from Portland, OR ever ended up here, I’d put them on a suicide watch. Quality coffee is a relatively new thing in this town that normally celebrates commodities, down to its streets named after mining and minerals. Hence it is surprising to see a few $3 espresso shots here without the “moral outrage” you’d normally expect from most cities that love to gripe about the cost of a cup of coffee. In Albuquerque, the espresso shots tended to run a bit thin on body and were often served in various presentation contraptions involving carved wooden blocks (or serving trays) and sparkling water on the side. One of the local oddities I came across was piñon coffee. Much as New Orleans has been known for blending regular coffee with chicory for a unique local variation, piñon coffee is made by combining regular coffee with nuts of the piñon pine tree (the official state tree). Native Americans traditionally harvested these pine nuts. Once roasted and brewed, it exhibits a sweet, spiced smell like an amped up Arabic coffee, but it tastes more like regular coffee with an earthy, nutty edge to it. An hour up I-25 from Albuquerque is the town of Santa Fe. Founded in 1610 by Spanish colonialists, the New Mexico state capital carries a lot more history — including one of the oldest houses and the oldest church in the U.S. Very much unlike Albuquerque, Santa Fe is a deliberately preserved town. This makes the stark contrast between the two not unlike the city of Napa versus St. Helena in the Napa Valley: one grows through big-box-store sprawl and lower costs of living while the other prefers a controlled aesthetic gentrification that makes it attractive to tourists with money. This means that Santa Fe, like New Orleans, is one of the few places in the U.S. where you know exactly where you are — i.e., not in some random urban center lined with all the same chain stores. Sure, there are many fancy restaurants and massive hotels and spas about town, but everything is harmoniously dressed up in Pueblo or Spanish style. Every building is some variation of an earthtone and the architecture is remarkably consistent. Despite the million-dollar Pueblo homes near the old city center, there are still plenty of tourists parading through town in rumbling two-story pickup trucks with tinted windows, Oklahoma or Texas plates, and blasting some variation on death metal out their windows. Yet at the same time there’s an extensive arts community and even the relocation of many Tibetan expatriates in town. Although Santa Fe is where locally roasted coffee was first introduced to New Mexico, the coffee culture here has generally been slow to evolve — with more options growing in just the past few years. Like Albuquerque, there’s often an unusual emphasis on an inventive rotation of specialty drinks. But here there is also a strange validation of the Paleo diet as something more than the snake oil fad that it is: a few places place their own buttered coffee knockoffs prominently on drink menus. I originally noted a lack of sweetness in the coffee of Santa Fe and Albuquerque, which I partly blamed on the altitude at first. But I eventually found examples that broke that stereotype, such as the excellent Iconik Coffee Roasters — easily one of my more favorite coffee house finds of the past couple of years. In conclusion, fallout from the Manhattan Project and Trinity tests may have left behind one unusual place and its residents, but the global advance of good coffee has infiltrated even here in just the past few years. Though for the record: Los Alamos scientists still drink pretty crummy coffee for the most part. This art café is located where downtown Albuquerque gets more industrial the further south you get. Opened by Trevor Lucero, a self-proclaimed “coffee guy”, in June 2013, this 1,000-sq-ft space and 600-sq-ft outdoor covered patio serves as much as a community gathering space as it does a coffee bar or art space. Third places are apparently a more natural setting in Albuquerque than they are in Santa Fe. There’s a short, wooden high counter with stools at the front windows. The white-painted brick wall in the rear is adorned with color photographs. Larger wooden block tables and a bench scatter about in the in-between spaces for contemplating with headphones or laptops under a white-painted wood ceiling. The laptop zombie quotient being higher as it is in ABQ. The Zendo name apparently refers to an international feng-shui-like term for the supposed spacial zen-like state of the joint. Or so we’re told. Whatever you call it, the place is packed with locals. It seems heavily frequented by a younger, more female clientele who take to eating take-out lunches at the bar stools and conversing with friends for the day. Rather than mistaking them for UNM students from the campus across the I-25 freeway, like much of downtown Albuquerque there’s little indication that the folks hanging out here do much of anything professionally besides, well, hanging out here. Señor Lucero bought a three-group manual Victoria Arduino Athena Classic for $6k that’s used at the bar. They originally relied on independent roasters but have since started roasting their own at a facility further down 2nd Street, though they do feature a rotation of guest roasters Denver’s Boxcar was featured on my visit. Using the Zendo Espresso blend, they pulled a shot with an medium brown, even crema with lighter heat spots from the spouts. It tastes of an edge of tobacco over more spices and herbal pungency. Good, but there are noticeable flaws. Served on a custom wooden block with even a spoon holder as well as sparkling water — like you do in ABQ — in a World Market China cup with no saucer. Cheap at $2 though. And like a number of ABQ coffee shops, they offer their own inventive specialty coffee drinks — except here they go a bit crazy with it: the London Fog, the Sweet Bonnie, the Maroccino, the Golden, the Regis, Red Cappuccino, Lapsang Latte, etc. Mixologists Gone Wild. Read the review of Zendo Coffee in Albuquerque, NM. After my discouraging visit to the much-lauded Ohori’s Coffee Roasters, I was worried that the coffee wasn’t getting much better in Santa Fe. Then I arrived at Iconik. Opened in May 2013 by Albuquerque native Natalie Slade, her brother Darren Berry, and their longtime friend Todd Spitzer, this café inspires a bit of local controversy. Some of the controversy originates from the intentions of this team: with Ohori’s being such a beloved local institution, they opted for more defiance and a dare — down to naming their flagship espresso blend “Iconoclast”. The rest of the controversy comes down to Santa Feans, as evidenced in local social media commentary and reviews. Although many locals have taken to Iconik, some seem a little resentful of the interloper — complaining about the coffees being roasted too lightly, about the service staff being too arrogant and snobbish, or perhaps even just expressing resentment over a $3 espresso. Only the second commercial coffee roaster to open in Santa Fe, their roasts are decidedly lighter — even if they are made in a very rare, 1927 vintage Otto Swadlo roaster that was found in an Oregon warehouse. The roaster sits at the café’s rear entrance. There’s outdoor patio seating in front with cushioned patio tables and chairs. Inside there are cement floors, a counter with stools, a long shared wooden table, multiple short café tables at the window seats, and even a sofa — giving it more of a vibe like a brighter version of SF’s The Grove. It’s a little loungey, and it would be a hipster magnet if not for New Mexico’s dearth of self-aware hipsters. There are also a number of older and colorful local Santa Fe patrons about, as the neighborhood is deep into the cheaper rents in town. There’s a wall of merchandising with Chemex equipment, grinders, and roasted coffee. They serve salad, bagels, and lunch items, but it’s all about the coffee. Using a three-group La Marzocco Strada, they pulled a shot of their single origin Sumatra Takengon Mandheling as the house espresso for the day. It came with a mottled medium-to-dark brown crema, a solid body, a good pungency, but little spice: a more narrowband flavor profile due to its single origin (not their Iconoclast espresso blend). Served as a long three sips in black Espresso Parts cups with sparkling water on the side. I normally prefer a more complex flavor profile for my espresso, but it was interesting — daring for Santa Fe even. And I had every indicator to expect that their Iconoclast blend wouldn’t be half-bad. Milk-based drinks come with rosetta latte art and gentle, even, quality milk frothing that somewhat integrates well with the espresso emulsion. Their V60 pour-overs are properly flavorful and included options such as a Mexico Oaxaca, a Guatemalan Panchoy, their Sumatra Idido Yirgacheffe, and Panama Hacienda La Esmerda. There is simply no contest about the best coffee in Santa Fe. Local loyalty to Ohori’s seems analogous to South Africa’s complicated relationship with the ANC: i.e., deep appreciation for something revolutionary achieved decades ago, but selectively blind to all of its shortcomings and failings in the years ever since. Some local haters might complain of the “burning acidity” of Iconik’s lighter roasts, but anything to make it taste this side of Ohori’s ashy wet fireplace is a good thing in my book. As for complaints of arrogant service, that’s always the risk when you’re dealing with someone who is really into their coffee. Customers can feel insecure, if not offended, when they casually order their favorite caffè latte and are suddenly confronted with a question such as, “Do you want it with the Sumatra Takengon Mandheling or the Mexico Oaxaca?” The nerve of those arrogant bastards. Santa Feans deserved better, and they’re now finally getting it. But it’s not just for Santa Fe. I’d very much enjoy coming to a place like this wherever it’s located. Read the review of Iconik Coffee Roasters in Santa Fe, NM. This is a difficult trip report to author. Because on the one hand, we have to pay respects to what Ohori’s Coffee Roasters pioneered in Santa Fe, NM. But on the other hand, we have to call out product failures as we experience them. Susan Ohori founded this two-store chain in 1984. She learned to roast from Alfred Peet, of Peet’s Coffee & Tea fame, and introduced commercial fresh-roasted coffee to Santa Fe. Like Peet’s, Ohori’s Coffee started as a take-home bean sales store. Also like Peet’s, as consumer preferences changed over the years, it evolved into a retail coffee beverage shop. This was particularly innovative in Santa Fe, where communal “third places” are rare and most social gatherings take place in private homes. Susan Ohori sold the company to her longtime accountant in 2002, and the tiny chain has operated rather consistently to this day under the “newer” ownership. This location on Cerrillos Road was the second retail shop they opened, and of the two it is designed to be more of a social gathering space. As I entered, even without knowing Ohori’s Peet’s origin story, I felt like I was in another Peet’s chain café. There are four café tables offering sparse seating in a vast space with tall ceilings with exposed wooden framing. There’s a service counter setup with a heavy emphasis on bean and leaf sales that looks lifted out of the Peet’s interior design catalog. And as for the roasted coffees themselves, many hearken back to a flavor profile of dark roasted ashiness popularized by Peet’s some 40 years ago. There’s a wall of merchandising (cups, machines, Chemex and pour-over paraphernalia), and the art on the walls here is generously showcased without commission. As for the retail coffee service, they may have dated roots but have not missed out on many coffee fads. They offer pour-overs, buttered coffee for those most recently into Paleo snake oil, and as a sort of health thing they avoid syrups and artificial sweeteners. Ask for a flat white, which is still not yet on the menu, and they will know how to make you one. Using a two-group Nuova Simonelli machine, they pull espresso shots in a short paper cup (what’s that the deal with that?) with a creamy-looking medium brown crema of a smooth texture that’s relatively thin. There’s a definite ashy edge to the cup: it’s very harsh with a flavor combination of smoke and ash. This is not a pleasant espresso, and we have consumed hundreds of cups of outright rot-gut espresso before. And yet Ohori’s has won the “Best of Santa Fe” by the Santa Fe Reporter for 7 of the last 10 years, and even the New York Times recently recommended this location in a 36-Hours piece. At first this lead me to believe that many local fans of the place must rarely ever drink the espresso straight here. But if that were only the case. The milk-frothing here is dishwater-like: thin with irregular bubbles, producing what seems like little more than milk-flavored air. My wife found the macchiato to be simply undrinkable and abandoned it after the first sip. She never does that. I tried it and sympathized with her assessment. I’ve never experienced this at a Peet’s Coffee, for example. Thus we can’t be sure that the coffee adoration here is rooted in local loyalty, nostalgia, or layers of milk and natural sweeteners that disguise the raw taste of their espresso. There may be other product lines worth trying besides their straight espresso and macchiato. Ohori’s offers medium- and even light-roasted coffees, even though they believe you often need a medium roast to at least develop the coffee’s flavor more fully — of which I am generally in agreement. But when the core espresso is this dubious for a best-in-town consideration, something is clearly wrong. And I would be the last person some might accuse of being a Third Wave apologist. Unless you are a die hard, dark roasted Peet’s Coffee fan, we have to recommend that you seek your coffee elsewhere in Santa Fe. Read the review of Ohori’s Coffee Roasters on Cerrillos Rd. in Santa Fe, NM. This central Santa Fe coffee house resides in the Santa Fe Arcade on the 2nd Floor. Opening in December 2015, it was developed as a new coffee house “concept” by an area restaurant group lead by Gerald Peters called Santa Fe Dining Inc. Yes, apparently coffee has become a restaurant theme in America, with this concept being self-described as “full-service third wave coffee house”. Which only underscores how the term third wave has become the modern coffee equivalent of the hackneyed gourmet label from the 1980s. We’ve been mocking the wannabe hipster use of third wave for a decade now, so most of you are probably glad we’ve largely given it a rest over the years. But ten years later and we’re still surprised that so many relative newbie coffee lovers come to its defense — and so much so that desperate marketers continue to use it. In the United States, a 1980s gourmet food movement evolved from a long-term division between elitist (or “gourmet”) tastes and a populist aversion to fancy foods. Sound anything like the many curmudgeons today who seem offended by the mere existence of “fancy coffee”? Also note that this transformation followed the establishment of supposed “second wave coffee” stalwarts such as Starbucks and Peet’s. The 1980s saw the popularization of many otherwise commodity foodstuffs to an elevated status with an obligatory gourmet label. Orville Redenbacher became synonymous with gourmet popcorn. Jelly Belly popularized the concept of gourmet jelly beans. Lather, rinse, repeat. Thus at the time, the word gourmet became a sort of shorthand nudge-and-wink to let consumers know that this wasn’t your father’s foodstuff and that its distinguished quality commanded a higher price. Compared to our coffee wave, your coffee wave is tough and chewy. Problem was that the term gourmet wasn’t backed by any real definition, guarantee of quality, nor certification. This left the barn doors open for every profit-minded copycat and charlatan to rush in and lay claim to its meaning. Thus today the term gourmet has since been relegated to downmarket product come-ons in the aisles at commodity goods stores such as Wal-Mart; meanwhile the premium quality/price vanguard has moved on to terms like artisan. 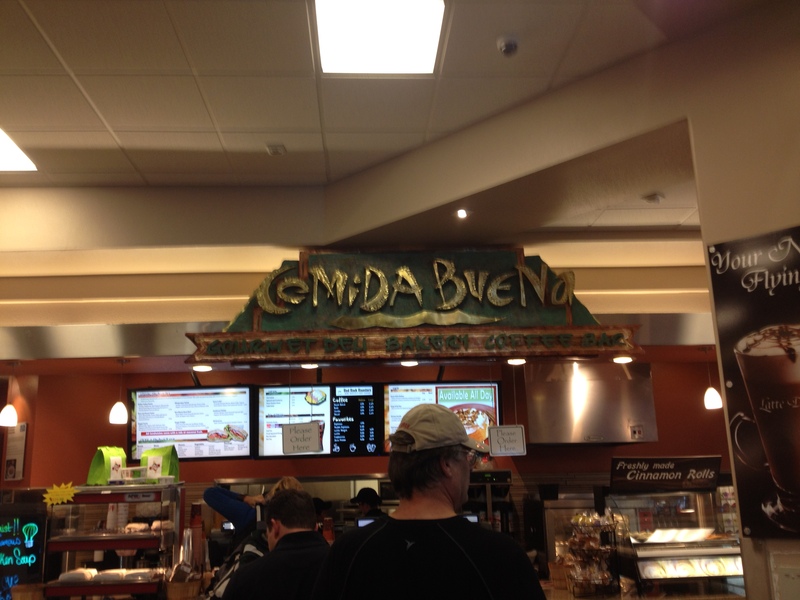 Just this week at the ABQ Sunport (airport), I walked up to a Comida Buena with bold “gourmet deli” branding that served me a soggy croissant sandwich wrapped in tin foil and left under a heat lamp for who knows how long. What does gourmet really mean when this happens? The same is true today of third wave coffee, which has become an unqualified label boasted by wannabes in an attempt to claim some sort of false legitimacy. Meanwhile, virtually all of the top-quality roasters and coffee shops in the world distance themselves from the term. What does third wave really mean when this happens? Which brings us back to the 35° North Coffee concept. Their slogan, coined by restaurant vet and manager Rob Rittmeyer, is “Find your latitude”. Its name refers to Santa Fe’s latitude as well as the number of grams of coffee used in their pour-overs. As part of a concept restaurant chain, the food gets a bit more of the attention here. They serve beignets, a croque monsieur, and banh mi sandwiches as a sort of French-influenced theme — even if French is a poor choice for a coffee affiliation. Accessed from inside the mall, there are five nicer faux marble café tables along a back booth and a marble rear counter with a half-dozen stools. There’s also a separate seating room (the “War Room”) with more and larger tables across of the main entrance. The kitchen, and its vent, are massive: these are clearly food people. And the food sensibilities don’t stop with edibles, as they even offer (as is creative coffee in New Mexico) an oatmeal latte: complete with actual oatmeal, brown sugar, and granola as influenced by Colorado ski bums. They do roast their own coffee on-site with all the space they have, but any labeling of blend, coffee origin, or other pedigree is virtually absent from a supposed third wave coffee house. They offer drip, pour-overs (supposedly single origin, but how could you tell? ), nitro coffee, and espresso service. And yes, they even offer something called a “Latitude Adjustment”: a nod to the Paleo snake oil types seeking a Bulletproof Coffee(tm) knock-off. All said, they use the three-group La Marzocco Linea behind the counter on shots of their “dark roast blend” to produce an even, medium-to-darker-brown crema of decent thickness. Whatever wave they are supposed to belong to, I have had identical coffee experiences in the late 1990s. But to their credit the espresso body is good, and despite being served in a short paper cup the results are better than expected. It has a darker flavor profile of herbal pungency with some tobacco but no ashiness. Read the review of 35° North Coffee in Santa Fe, NM. When it came to coffee in Sacramento during the 1990s, Java City ruled the earth. Starbucks made their imprint like every other market in America, but Sacramento was Java City. Even longtime Sacramento coffee institutions like The Weatherstone — now part of Old Soul — once fell under the Java City spell in the years since its 1974 opening. Java City eventually closed all of their retail locations by 2012 to focus on wholesale bean distribution. As local coffee entrepreneur, Sean Kohmescher, put it: “Java City’s lack of focus on its retail end hurt its café location(s)”. Who is Mr. Kohmescher? The founder and original barista of Temple Coffee Roasters, which was established in 2005 in Midtown Sacramento. Exemplifying Sacramento’s newer generation of independent coffee roasters that first came to prominence in the mid-2000s, Temple has since expanded to several Sacramento area shops (including one in nearby Davis, CA) and a nationally recognized roastery. This downtown location opened in early 2006. Located between the homeless encampments/tents in Cesar E. Chavez Memorial Plaza and the random screams of doorway-dwelling street people along the K Street Mall (an area that has always been a little sketchy), this shop attracts a decidedly student-oriented clientele. Out front there’s fenced-in sidewalk seating, consisting of a long wooden counter and chairs under parasols along 9th St. Inside they painted the ceiling ducts black, left crude cement slab floors, with a painted coffee menu on the cement block rear wall espousing espresso, French press, and pour-over options (using clear Hario V60s). They have two long, live-edge wood tables for shared seating plus a side bench with various students plugged in to earbuds and laptops. On the opposite wall is a significant wall o’ merch (pots, drippers, brewers, T-shirts, beanies, mugs). They offer a plethora of roasts for sale, and for their espresso at the time of our visit they offered their Dharma Blend, Ethiopia Limmu Burka Gudina, and a Colombia San Jose decaf in different grinders. Ordering an espresso with their Dharma Blend, they served it from a four-group La Marzocco Linea PB. Despite the stripped-down environment, they brought the espresso to our seat with a small wooden tray containing the espresso in a white notNeutral demitasse and a small glass beaker of sparkling water. Thoughtful and classy. It came with a mottled darker and medium brown crema with a good coagulation and thickness. The flavor is “dark” with a full-bodied mouthfeel: there’s molasses, chocolate, and caramel. As an espresso I didn’t get much of the stated cherry, but as a macchiato the cherry comes through more. This is a robust, untrendy espresso that still believes in dark, body-driven complexity — a well-blended coffee that’s just about as good as you can get anywhere. Their milk-frothing is dense and quite good also. Read the review of Temple Coffee Roasters in Downtown Sacramento, CA.